During the committee hearing on Thursday, Democratic Sen. Mazie Hirono (Hawaii) declared that “too many of these nominees have spent their careers opposing the rights of women, minorities, the LGBTQ community, and Americans who need affordable healthcare.” Highlighting a few nominees’ records, she read some of their public comments and rulings to demonstrate their strongly held far-right views. The advancement of the 44 nominees, who are expected to be confirmed in floor votes by the Republican-controlled Senate, follows the release of a study that, as Common Dreams reported last month, outlined Trump’s ongoing effort to stack the federal courts with far-right judges. The Senate Judiciary Committee displays contempt for our courts and for our democratic institutions by rubber-stamping more than 40 of Trump’s judicial nominees. These noms are radical, and overwhelmingly white and male. 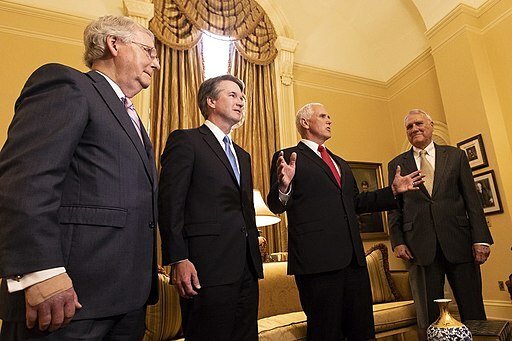 “In just the first two years of this administration, the Senate has already confirmed 85 federal judges, including two Supreme Court justices,” Harris said. This entry was posted in Civil Rights, Climate Change & Environmental Issues, Corporate Personhood, Corruption, Economics, Government, Health Care, LGBTQ Issues, Racism, Religion, Social Justice, Water, Women's Issues, Workers' Issues and tagged Civil Rights, Climate Change, Corruption, Department of Justice, Economics, Environment, Equality, Health Care, Human rights, LGBTQ, Racism, religion, social justice, Women's Issues, workers' issues on February 9, 2019 by ew.